A great feature of the ScanSnap Windows scanner software is the ability to create Profiles, or pre-defined groups of scanner settings. 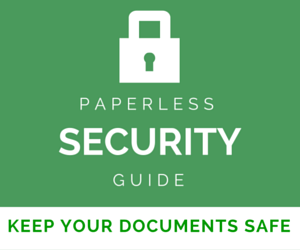 They allow you to process your documents quickly and efficiently. Once you get your ScanSnap Manager Profiles set up just the way you want them, how do you back them up? If you get a new machine, how do you move ScanSnap Profiles to a new computer? 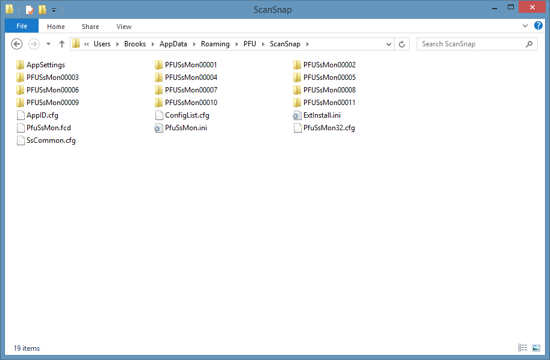 On Windows 7 and later, go to File Explorer and navigate to C:\Users\yourusername\AppData\Roaming\PFU\ScanSnap. yourusername would be replaced with your Windows username. If you can’t see the “AppData” folder, go up to Tools | Folder Options and set it to be able to see hidden files and folders. If you use a backup system like CrashPlan, Backblaze, or any other system, make sure this ScanSnap folder is included in your backup. Of course, you can also just copy the folder manually. Each of those “PFUSsMon0000x” folders corresponds to one of your profiles. Copy all the files/folders that start with PFUSsMon0000 from the old computer to the new computer’s ScanSnap folder. Start ScanSnap Manager on the new computer and disable Quick Menu. Your profiles should be there. 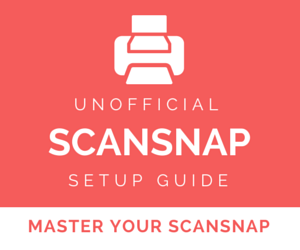 If you want more help with your ScanSnap setup, you might be interested in my Unofficial ScanSnap Setup Guide. Many people have found it helpful. This article was originally written in December 2008. It was updated in July 2015. Jeff is right. You also need to copy the ConfigList.cfg file to the new computer. Without it all the copied profiles are not recognized. If you open ConfigList.cfg with Notepad you will see that it enumerates all of the custom folders. I have 14 of them. Without the correct copy of ConfigList.cfg Scan Button Settings only showed the first 4 default profiles. I could use some help. I cannot find the answer to this anywhere. Is this process supposed to move the data contained within the programs, like the ScanSnap Organizer? I moved all my PFU files from my previous Windows 10 laptop to my new Windows 10 laptop. I disabled d the Quick Menu. I open ScanSnap Organizer and there is no data. I have tried importing data and nothing happens. Do I not have the ability to move Organizer data from one machine to another? These instructions are for moving Profiles in ScanSnap Manager (the program that controls how the ScanSnap scans). It’s not for moving ScanSnap Organizer data. 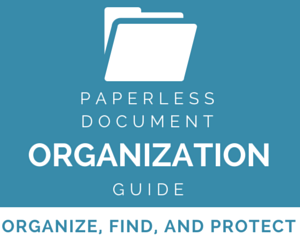 If you want to do that, your ScanSnap Organizer documents are probably in a folder called “ScanSnap” or “My ScanSnap” under Documents. Copy those to the new computer and you should be good to go. Of course back up everything first! That was almost too simple! I thought the data was in the program data folders. I did copy it from the Documents/ScanSnap folder (from my backup) and pasted into the new machine ScanSnap folder and they appeared as before. I now have a better understanding where the ScanSnap software sees the profiles and data. Thanks! Does this procedure work for ScanSnap for fi series as well? You also need to copy the ConfigList.cfg file to the new computer. i could not get it to work until I also copied that file. Exactly, with that it worked! @Brooks: A small update of your instructions would be ideal! I was scanning to folders on my D: drive and changed to a location on my C: drive. Is there any way to get the scans/files from D: on to C:? It seems file names are the same and there would be much overwriting if I just copied them to the PFU folder. Thanks so much for the great information on how to move profiles. I didn’t know about “PFU” and couldn’t find them — you saved me a lot of work. I’m a bit late to the party, but was wondering how to transport the files from my Windows 7/64 PC to my new iMac – or if it is even possible? I don’t think that one will work, since they’re stored in different formats. I think you’re going to have to recreate them in that case. Good question! I’m getting a new computer. Can someone explain how to move Scansnap files & Rack2-Filer Smart files to the new computer. The “Help” menus seen to be gibberish. 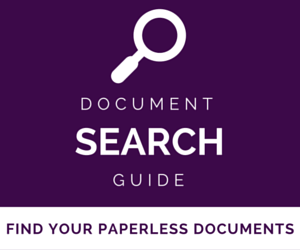 For the ScanSnap Profiles, I use the instructions in this post. I just did it on Mac the other day. Not sure about Rack 2-Filer. I’d check with Fujitsu support. Their chat support is generally pretty helpful: http://www.fujitsu.com/us/services/computing/peripherals/scanners/contact/index.html. Brooks, this is an older post and the path is no longer valid. Do you know the correct information now for how to do this? The thought of recreating all those scan button settings is rather daunting and I’d appreciate the help. OK, I’ve updated the post as of Windows 8.1. Tom from 2012’s question is intriguing. 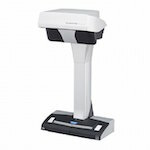 I am thinking of getting a scansnap scanner, and would love to just play with the software a bit before I make that decision, but unfortunately Futisju does not allow that. I assumed you could install this at the all users level to prevent the very Dilemma Tom is having. Is it still true that you can only install this at the user level? If so, does anyone have a good response to Tom’s question? 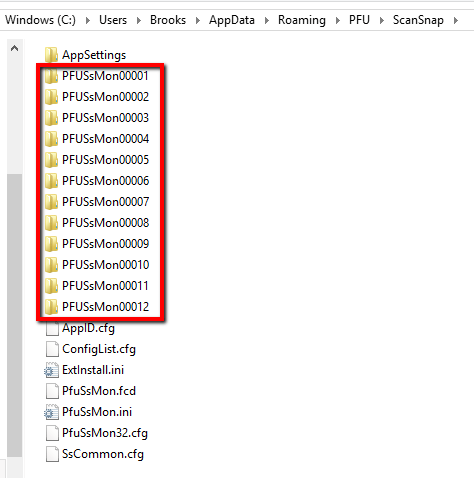 On Win 7 its %appdata%\Roaming\PFU including all subfolders that should be backed up. How can you share the ScanSnap Profile Settings between all users on one PC? I mean, if one user changes the settings, all the users use the new settings.